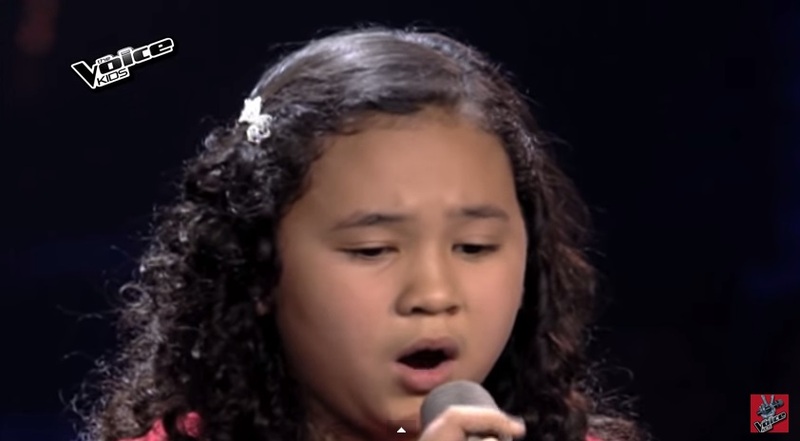 MANILA, Philippines - Eleven-year-old kid Terese Celo from Bacolod City made all the three coaches turn for her on Sunday's episode of "The Voice Kids Philippines" Season 2. Terese sang Wency Cornejo's "Hanggang" which impressed the crowd and the judges. Terese chose to be part of Team Sarah, joining Kyle Echarri, Krystle Campos, Zephanie Dimaranan, Gian Ale and Francis Lim. At the end of the Sunday's episode, 16 artists already secured the spot to the next phase of the competition, the Battles. Geronimo already recruited eight young artists Alexia Dator, Ken John Membrano, Terese Celo, Kyle Echarri, Zephanie Dimaranan, Francis Lim, Gian Luigi Ale and Krystle Campos. Meanwhile, Mañalac had five recruit: Romeo Espino, Atascha Mercado, Altair Arguello, Christian Pasno and Lance Kharl Macalinao. Salonga had three: Bianca Marbella, Reynan Dal-Anay and Stephanie Jordan.